Baumüller will present its wide range of Industry 4.0 solutions at the Hannover Messe from April 23-27, 2018. In hall 14, stand H12, the experts will use demonstrative exhibits to show the advantages of simulations, wizardguided commissioning, predictive maintenance and intelligent process monitoring. At this year’s Hannover Messe, in addition to systems and components, Baumüller will present a wide range of services, covering consultation and engineering services for mechanical engineering and machine operators, as well as complete service throughout the entire life cycle of machines and systems with its different subsidiaries. In this way, visitors to the trade fair stand can find out about the design of new drive systems and the optimization of existing drive systems as well as learn about the wide range of training sessions on offer and the latest tools and software solutions. In addition, experts will present current service concepts from the field of Industry 4.0. At the trade fair stand, Baumüller will show live how to optimally link individual production processes with the right interfaces. Using the example of an interlinked system, Baumüller will show how machines can be coupled so that several steps occur in one process. The automation specialist equips entire machine modules, from the motor to the software, which can then be linked to each other via suitable interfaces or that can be integrated into existing systems. The modular structure also continues in the software. Users can acquire individual pre-programmed functional modules or entire modular libraries containing validated modules, thereby shortening development times and increasing the quality of the software. The commissioning wizard is particularly user friendly in the software area. This quickly and intuitively guides the user through the individual commissioning steps, such as the commissioning of servo pumps in the injection molding area. Users therefore benefit from a quick commissioning with a lower probability of errors. Mechanical engineers and users can shorten development times and optimize existing systems with the latest simulation services and component models from Baumüller. Using a so-called digital twin, the machine performance can already be predicted in the design process. In this way, the machine’s behavior during operation can already be tested prior to commissioning and errors can be detected and rectified at an early stage. Mechanical engineers also receive all of the required project data about the drive train already at an early stage of the development process and can thus design it accordingly. This shortens the commissioning times and the probability of errors is greatly reduced. In addition, this eliminates preliminary commissioning at the mechanical engineer's location and the machines can be set up directly at the customer's location. The new virtual models can not only be used to design drive systems, but they can also be used to optimize existing systems. Potential for improvement can be identified and tested in the simulation. Baumüller is presenting additional innovations in the smart services sector. With BAUDIS IoT, the automation specialist is exhibiting an intelligent solution for optimizing processes and for continuously monitoring components and machine states. 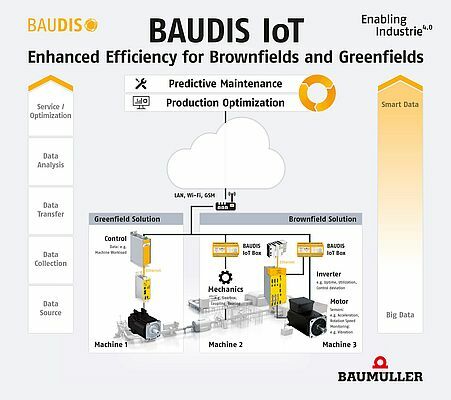 BAUDIS IoT collects and analyzes data, which is then recorded, archived and evaluated on site by the operator or via a cloud at the company headquarters or at an external service provider location. This data is analyzed using algorithms, which are constantly evolving and thereby becoming more intelligent, in order to then be able to issue useful recommendations for process optimization or maintenance activities to the machine operator. BAUDIS IoT is manufacturer-independent and can be retrofitted at any time. It uses big data to improve processes and prevents long downtimes and unexpected service cases.